Captain Joey and her space crew are approaching a hidden planet, known only in the ancient past as Earth. They have heard rumors that a weapon transformed the entire planet into gold, and they are searching for that weapon to protect their people against the dreaded Federation. 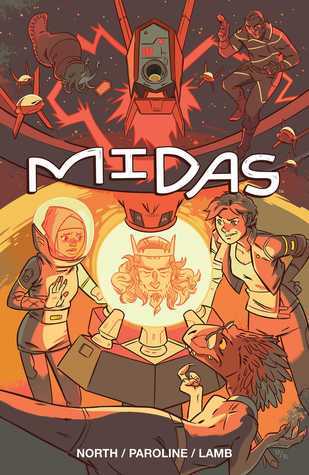 But when the “weapon” turns out to be the perfectly preserved body of the legendary King Midas, can Joey and her friends still find a way to stop the power-crazed Federation general from enslaving their home planets? This epic space saga covers a lot of ground, from the total destruction of several planets to long-forgotten mysteries of the ancient past, and Captain Joey and her intrepid crew are just the rebels to boldly adventure through it all and still find time for snarky one-liners and peppery dialogue. The plot is never dull, and does a good job of giving a lot of world-building information in small chunks that fit in with the action. I was surprised at every turn in the plot, and I kept thinking, “There is no way they are gonna make it out of this one.” But somehow the team would pull through, only to be confronted by another impossible challenge! I was immediately attracted to the gorgeous artwork. Each panel is full of action and drama. I loved the colors and movement, and felt connected to the characters through their facial expressions and body language. I adored every single character, and loved slowly finding out more about their backstories and how they became a team of crazy explorers rebelling against the Federation. I would recommend this book to ages 10-100!